This entry was posted in Baleen Whales (Mysticeti), Everything Else, Seals and tagged BonnevilleDam, California Sea Lion, Chinook salmon, Columbia River, Humane Society of the United States, National Marine Fisheries Service, National Oceanic Atmospheric Administration, Sea lion by Kirsten Massebeau. Bookmark the permalink. 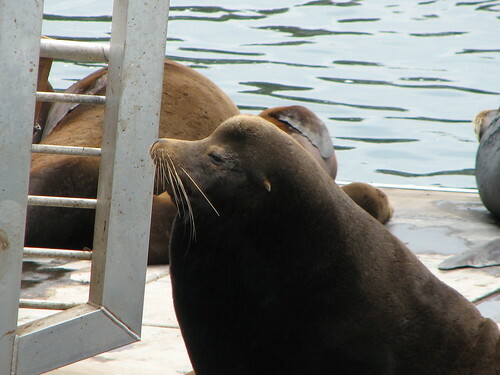 Hello, I was a sea lion predation observer at Bonneville dam in 2008. I watched and documented how many salmon individual sea lions were killing and eating below the dam. 2008 was the first year any sea lions were removed from the dam and predation rates dropped that year from 2007 as you pointed out. Every year since 2008 more sea lions have been removed from below bonneville dam and every year predation rates by the sea lions has dropped. this makes sense because the same sea lions come back year after year to eat salmon below Bonneville dam. 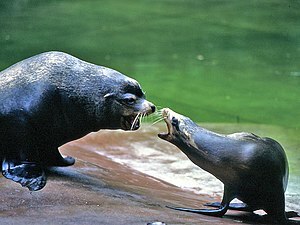 The predation rates are dropping because predatory sea lions have been removed. Although I do not agree with the removals they are working. I appreciate your comments particularly the fact that you participated in counting of those sea lions, but as MS. Young pointed out during her testimony before the congressional committee on house resolution 946, the entire issue is to increase fish returns to the Columbia River system. The selecting of sea lions as a focus point without considering a large number of other factors that may have an equal or greater impact seems entirely an overreach and exclusively detrimental to these marine mammals.The Marine Mammal Protective Act evolved to protect those species at risk. Granted the sea lion populations have greatly increased under protection but the proposed changes to what is allowed under 946 would impose drastic changes that are totally unacceptable in my estimation.. Enjoyed your very informative post. Thank you.